The Short Version: If you’re of a certain age and haven’t been on a dating site or app before, online dating can seem like a giant hurdle standing between you and a mature relationship. Many senior singles don’t know what to expect or where to start. Some may doubt their ability to navigate the site’s tools, and others may worry about online scams. There are a lot of question marks involved, so it’s only natural to hesitate before taking that leap into the online dating world. Fortunately, certain impartial reviewers have made it their mission to inform, advise, and empower mature singles online. MatureDatingSite.org publishes thoughtful and thorough reviews on the best dating sites and apps for singles over 50. Anyone wondering how online dating works for mature users can read through the site’s resources to get their bearings and become an online dating expert in short order. Dating in the modern age is far from simple. Between the thousands of sites and apps available and the growing tendency for online crushes to disappear in a puff of ignored messages — it can be pretty rough out there. It also can be particularly intimidating and perilous for singles of a certain age. Seniors re-entering today’s dating scene after a long hiatus often can have trouble navigating the technologically advanced medium of online dating. MatureDatingSite.org ranks SeniorMatch as the best senior dating site in terms of overall user experience and affordability. Fortunately, MatureDatingSite.org has put together simple resources and clear reviews to help singles over 50 date successfully on a trustworthy niche site. Danny, the Founder of the reviews site, said his main motivation was to make online dating more accessible to senior men and women who may not know much about how it works or where to go to have a good experience. Scammers often prey on elderly daters online, so having a team of dating experts to direct users to safe resources is invaluable to thousands of newcomers to the online scene. Over the years, MatureDatingSite.org’s team has created many helpful resources for mature daters around the world. On MatureDatingSite.org, singles who are 50 and older can learn about dating resources geared to their needs. The third-party reviews site clearly outlines the subscription prices, premium features, customer service, and other aspects of the most popular and trustworthy senior dating platforms available. The site’s team has scoured the online world for the best and the safest dating tools, and now they wholeheartedly recommend the top five dating sites for seniors. This free information is incredibly useful to daters of a certain age. If you’re new to online dating, reading these reviews can teach you what to expect from senior dating sites and help you make an informed decision about which senior-only dating networks are right for you. 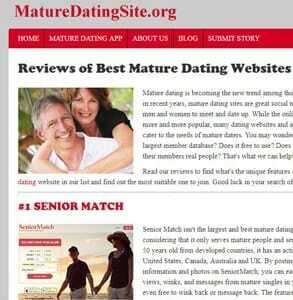 MatureDatingSite.org’s reviews direct seniors to safe, effective, and reliable dating platforms. Danny told us MatureDatingSite.org reaches many mature singles around the world. The audience sweet spot is in developed English-speaking countries, including the US, the UK, Canada, and Australia, but the team is steadily growing an international readership hailing from all corners of the world. MatureDatingSite.org is constantly growing to assist and inform more people in the senior dating niche. Recently, the site has expanded to include reviews of senior dating apps to help users adjust to an increasingly mobile-dominated dating world. In a concise paragraph, the review sums up why that particular app made MatureDatingSite.org’s top-five list and then provides links where readers can download the app in the iTunes store or Google Play. Reading through the reviews on this site is a good way to get oriented with the senior dating space and find the right online tools for your needs. The MatureDatingSite.org team may be small, but the team members have a lot of industry knowledge behind them. Every staff member has more than a decade of professional experience in the mature dating niche. You can trust these third-party reviewers to expertly assess today’s top senior dating options and recommend the best path to finding mature romance. MatureDatingSite.org provides clear and straightforward assessments of senior dating websites. The website’s team members take the time to sign up to each dating site and try out its features before writing an unbiased review, and they have joined countless platforms in the search for the top five senior dating sites in the business. With thorough reviews lists and blog posts, the MatureDatingSite.og team warns users away from potential scams and highlights the most well-established dating websites and apps where people over 50 can mingle without fear. Simply joining a senior dating site isn’t enough to guarantee romantic success. You have to know what to do and how to use the tools at your disposal to attract interest and reach your relationship goals. That’s why MatureDatingSite.org goes an extra step and posts supportive step-by-step articles about the nuances of senior dating. The Mature Dating Advice and Tips blog is full of helpful tips from dating experts who know what they’re talking about. The posts offer advice on everything from creating an eye-catching dating profile to avoiding unsavory characters on the web. You won’t just find online dating tips here; the blog also covers offline dating tips, including how to act on a first date and the best gifts to give your dating partners. The MatureDatingSite.org blog can answer any questions you have about joining, using, and excelling on senior dating sites. You can even find mature dating recommendations sorted by country (categories include the US, Canada, Australia, and the UK) for more specific advice. Senior singles face unique challenges in the online dating world. Not only do they have to remember how to be single again, they have to learn about swiping, avoid scams, and attract a partner who’s comfortable with their age. That’s a lot for someone to deal with just to find a date. Over the years, MatureDatingSite.org has built a comprehensive resource for senior daters hoping to build friendships and relationships online. A dedicated team of dating experts offer valuable insights to guide people through a niche dating space and make online dating more welcoming to people of all ages. MatureDatingSite.org has hundreds of helpful reviews and dozens of blog posts to educate mature singles, and the website isn’t done growing just yet.